Now that you’ve now been introduced to Bicycle City, when it comes to getting your coffee fix, a few innovative minds in Brooklyn, New York, are providing a preview of the kinds of amenities you could expect to see in such a place. One that perhaps complements a bicycle cafe. 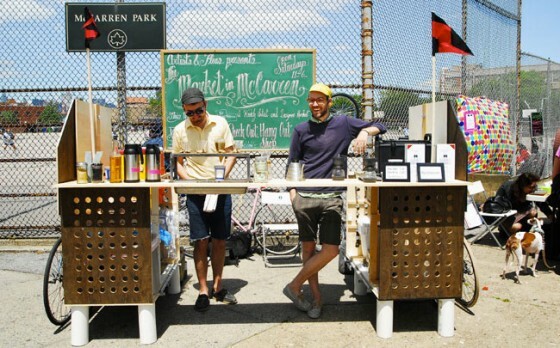 Kickstand Coffee, in a nutshell, is a 9-foot long portable coffee bar that folds up and is transported via two bicycles. Founders Aaron, Neal and Peter even crafted a system to offer both hot and cold coffee which you can learn more about here. They’re looking for ways to be zero energy, so if you have ideas to replace their propane camping stove, let them know. They’re currently working on a bicycle powered bean grinder.